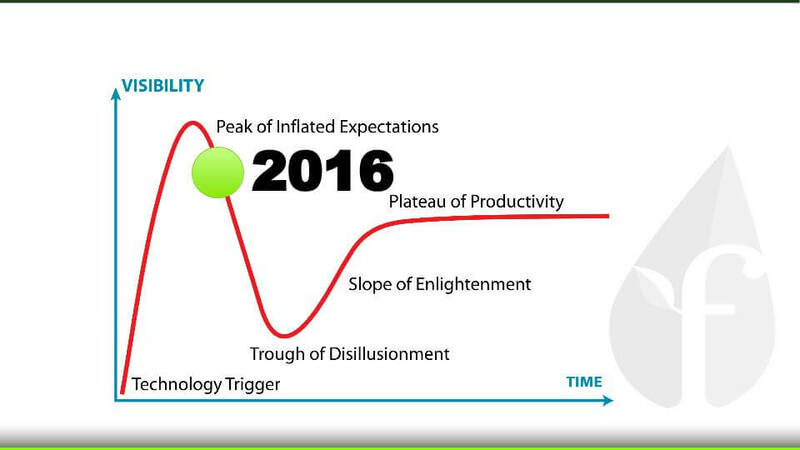 2016 Will be Rough for Startups. Here’s Why that’s a Good Thing. Startups are taking over the world, and that’s not going to change anytime soon. However, you would have to be living under a rock to not see that the ground is shifting beneath us, and the playing field is changing for all startup founders, investors, and employees. The most obvious change in the last few quarters has been the drop in startup valuations. We are clearly past the “unicorn madness” of the last several years, and as a result, many people fear that we’re on a Gartner Hype Cycle-type trajectory towards a significant trough. However, I don’t happen to believe that the above is an accurate portrayal of where we stand. I believe we are just seeing a natural correction – a dip indicative of a “hangover” from the lavish party of startupland these last few years. This year might be painful for many people in startups, but in the end it is a good thing. There is a seed valuation slump happening right now, which may seem like a bad thing for startups. However, this is just a natural correction from the outrageous $10MM – $30MM post money valuations we have seen for seed-stage companies across Silicon Valley recently. It was truly “partytime” in seed-land. But now, party time is over. Things are going back to the way they were, and post-money valuations will return to more reasonable levels. 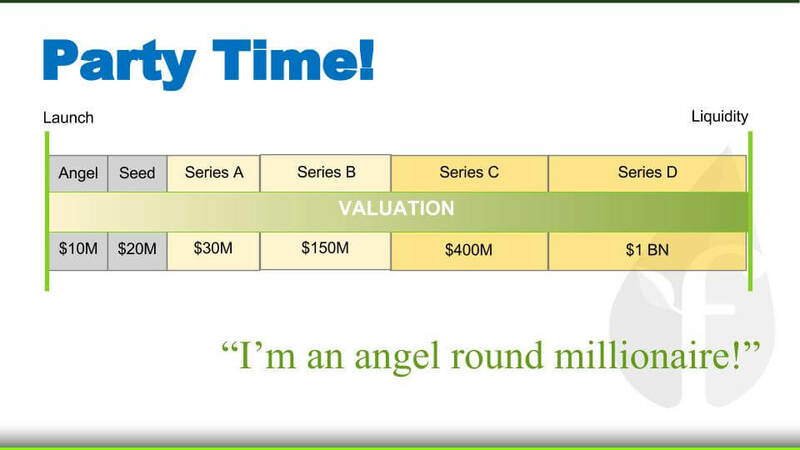 Instead of $10MM post-money angel valuations, you’ll see $3MM – $8MM ones. Instead of $20MM post-money seed deals, you’ll see $5MM – $15MM ones. However, this is not a reason to panic! 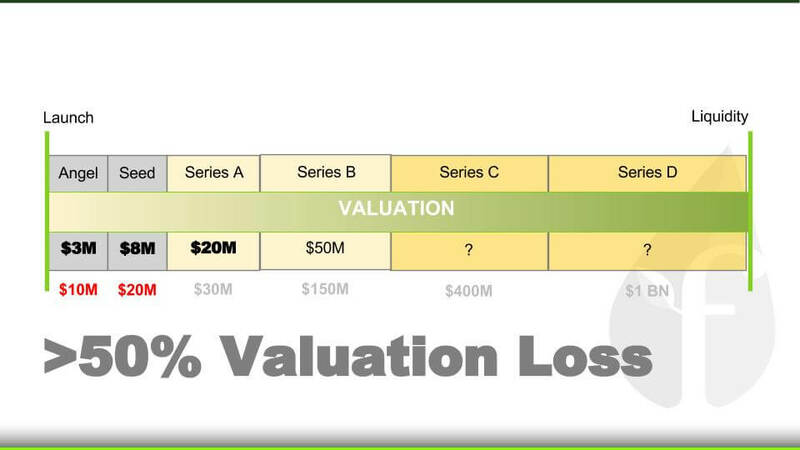 Put simply, startup valuations in the seed and angel stages will now be more realistic and sustainable. Also, if you missed the window to raise a huge angel or seed round, don’t fret, because many of those who did are in big trouble. Read on.. 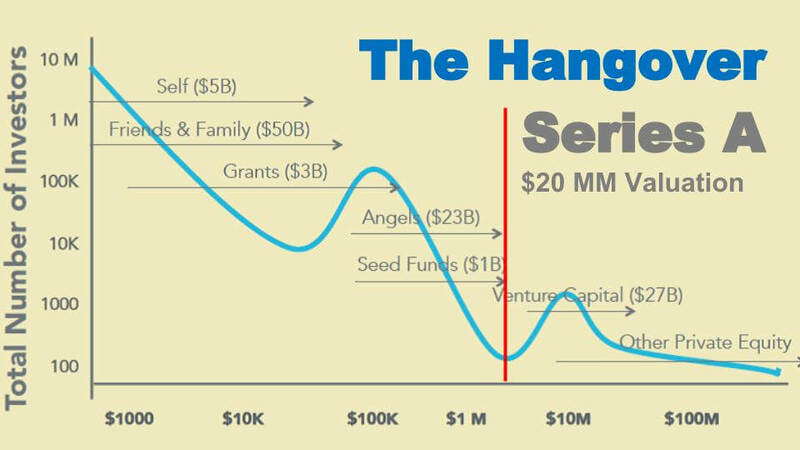 If you raised a huge angel or seed round during the party-time valuations of the last 18 months, then to put it bluntly, you’re screwed. Many of these companies are scrambling right now. You are seeing a lot more “strategic” investments, and many startups returning to the angel and seed markets for second, third and fourth anemic rounds of funding. Even worse, there has been a recent flurry of lackluster acquisitions, acqui-hires, and mergers for Founders down to their last options, just trying to save face. This will be where the biggest correction in the larger “dip” occurs, and for many founders it won’t be pretty. But again, this is simply a “hangover” from the party in seedland, and I don’t believe it will last very long. Everyone from small banks to large government agencies are running seed-accelerators today. In addition, the competition for recruiting strong companies is fierce, the economics are challenging, and the gap in quality across seed-accelerators is striking. There are simply way too many seed-accelerators than the market can support. I would estimate that there are over 1000 seed-accelerators across the globe that simply cloned the YC/ Techstars business model, and expected similar returns without the same leadership, network, and follow-on funding opportunities that make these programs so effective. Unfortunately this is not gonna happen for most..
As a result, hundreds of seed-accelerators will be forced to vertically integrate, consolidate, or quietly stop accepting new cohorts. This will leave just a few major global players, with an additional few local and specialized programs in each city. This trend has already started, as evidenced by the Techstars acquisition of Up Global, and the YC acquisition of Imagine K12, and I expect to see similar moves by other organizations in 2016. However, just because there are fewer accelerators now than there were in the last few years, that doesn’t mean that interest in startups is on the decline. It is simply consolidation due to challenging economics, and I believe the influx of angel investors and crowdfunding will more than make up the gap for early-stage founders. The idea that there are a half-dozen seed-accelerators in every major city around the world is simply not realistic. During the last few years of the party, Founders gained more and more leverage, and were able to use this leverage to get very favorable investment terms. You were seeing the most founder-friendly investment deals since the 90s. 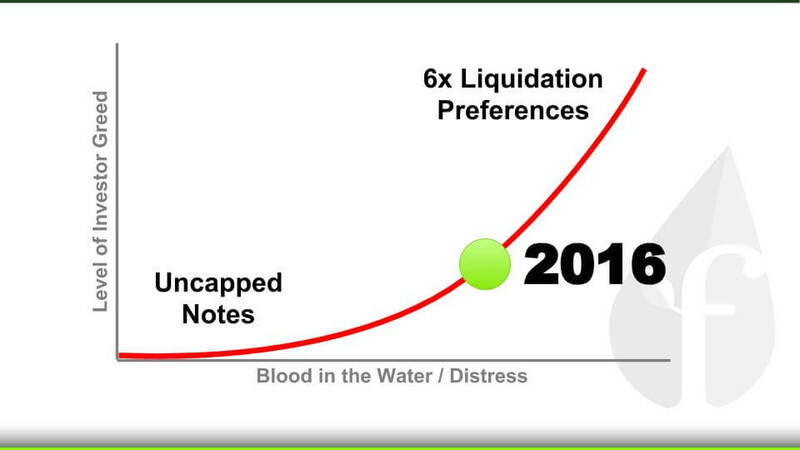 Now that we are in the hangover phase after the party, the leverage is headed back in the investors’ favor. 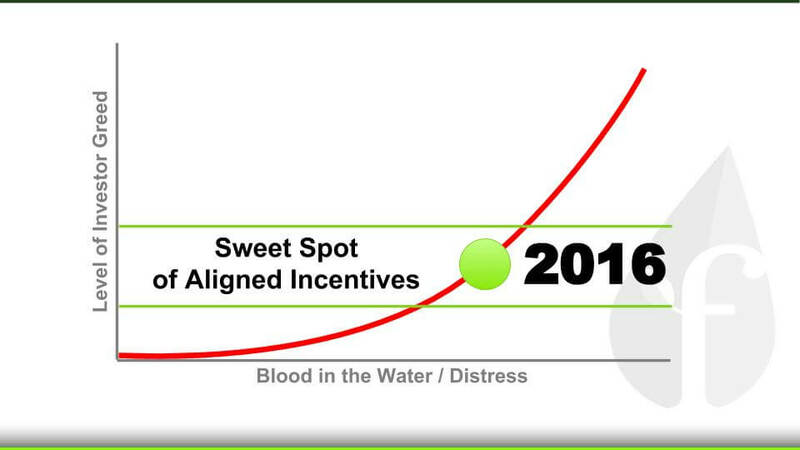 During this hangover, I think we will find a veritable “sweet spot” in aligned incentives between founders and investors. The best relationships are built on fairness, and I believe there will now be a drastic reduction in the abuses on both the sides of the investor and the founder. I believe part of this “sweet spot” will be the rise of investing in common stock, compared to preferred, at the earliest stages of a company. Only when the investors and founders own the same stock can there truly be fairness, so I don’t think it’s out of the question to see nearly 10% of early-stage deals done with common by the end of the year. While the previous four corrections may seem foreboding for founders (trust me, things aren’t as bad as they sound), our current hangover is something that everyone can get excited about: there are going to a lot of billion dollar companies that, finally, don’t come out of just Silicon Valley, or even the United States. 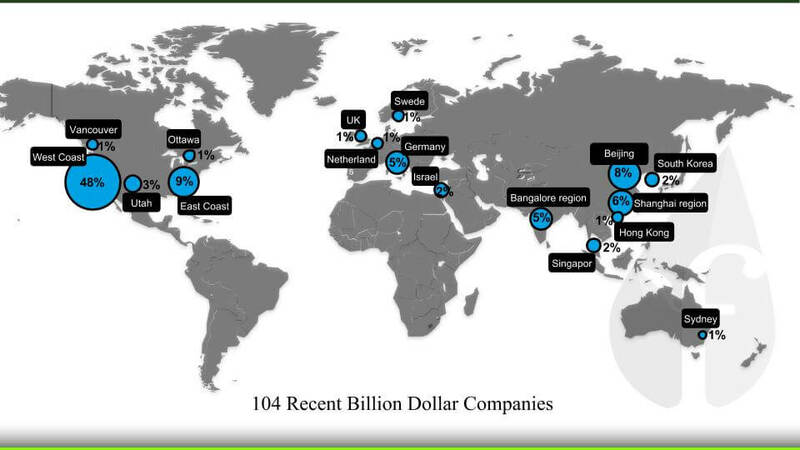 For the first time ever, the most recent batch of billion dollar companies from the United States dipped below 50% of the number of billion dollar companies worldwide. And while Silicon Valley continues to dominate in the global startup scene, recent data suggests that its presence will continue to diminish as international companies rise to the fore. In fact, I would even go so far as to say that starting this year and into next year, more billion dollar tech companies will be built outside of the United States by a huge margin. So if you’re a founder looking to launch a startup anywhere that’s not America, you’re in luck. If these startup “corrections” scared you (which they shouldn’t), here are some things for you to do to help your company survive this hangover. Raise now. Get AT LEAST 24 months of cash to help your startup survive the dip. Be humble. Believe in yourself and your company, but with investors being more cautious, set realistic expectations for how much money your startup needs, and how aggresive your growth targets can be. Build something great. If you’re lucky enough to raise funding, don’t blow it on luxuries your company doesn’t need. Focus on things like product and NPS, and KEEP YOUR BURN LOW. Don’t worry. Leave the funding world to the investors, because if you create a meaningful product, the money will come. Yes, many of the points I make in this post may make the future of startups seem bleak and depressing, but these are just the results of a hangover after a really, really good party. In the long-run, this dip will force everyone to make smarter decisions when building and funding companies, and that means that the future of startups will more sustainable and brighter than ever. Editor’s note: This post was written by Adeo Ressi, Founder & CEO of the Founder Institute. Originally published on the Founder Institute blog.